Suitable for very sensitive armpits. 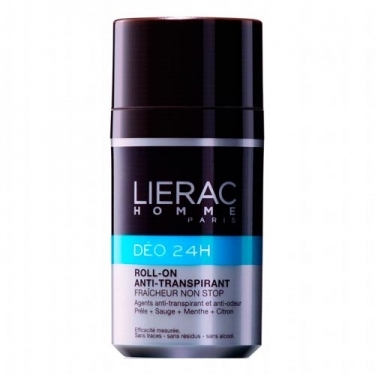 DESCRIPTION: Déo 24h Roll-On Anti-Transpirant from Lierac is a long-lasting deodorant, especially suitable for human skin. Its action regulates perspiration without blocking and neutralizes the bacteria responsible for bad odors. Provides long lasting protection and a feeling of freshness. Its roll-on format contains soothing properties that do not irritate the skin. With a 24-hour effectiveness, it does not stain, and ensures a sense of well-being throughout the day. No alcohol. Formulated with a horsetail and salve complex, antiperspirant agents that neutralize the odor. Enriched with mint extract and lemon essence for a continuous freshness action. It also contains glycerin that leaves the skin smoother. Apply on the clean and dry armpit.